Successfully Added High Definition Camera Clock with Motion Detection (4GB) to your Shopping Cart. Introducing the High Definition Camera Clock with Motion Detection - high quality, covert surveillance that is completely undetectable! This brand new hidden camera clock looks and works just like a luxurious table clock, but actually holds a virtually undetectable pinhole video lens and is a super secret agent clock! Beautiful and durable, this Camera Clock was designed to look like a high quality desk accessory - but only known to you is it a clock and amazing surveillance gadget! Whatever the reason might be. Having a gadget such as this clock will contribute immensely in protecting the things you love best, as well as catching people in the act. Just place this clock on your nightstand, living room, or office desk, and come back the next day to review all the activity for the day. You may be surprised at what you find! The Camera Clock secretly captures video at a high-definition 1280 x 960 resolution with 30FPS (frames per second) for super smooth motion capture, as well as 2560 x1920 resolution instant picture snapshots. To make things even more interesting, this gadget clock comes with motion detection video recording too! Anything that moves in front of the lens will be captured in crystal clear quality, so you can leave this surveillance/ gadget in front of your desk or night stand, and see who has been going through your things! 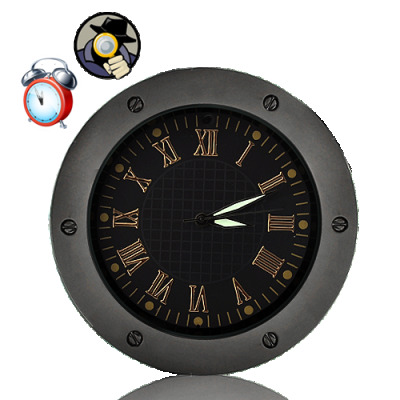 With easy one button recording, high quality pinhole lens, and a solid yet fashionable design, this clock is sure to become a top selling item. If you are a reseller this is a good chance to sell a unique device before anyone else. Place your orders now and we will express ship your order by tomorrow. And don’t forget, this gadget is backed by our famous 12 month warranty and is in stock now. Available only from the leaders in wholesale electronics and devices - Chinavasion! Does this gadget record audio? Yes, this alarm clock will record audio along with the video! However, there is no audio-only recording. This is brilliant, I used it for security in my hotel room while on holiday, shame no longer available as a few friends want them now! on 2011-03-17 02:35:01 This is crazy ! works perfectly and the price is just unbeatable. This thing usually costs 100 euros, here only 30. all items i ordered arrived after 4 days in italy. keep up the good work chinavasion!